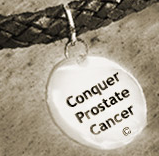 Cancer of the prostate in its curable form is very tiny, less than the size of a pea. It is totally incased and surrounded by normal prostate tissue. As such, it causes no changes in how a man passes his urine. It will not cause pain or bleeding. In short, it is totally silent. In this state the only way it can be suspected would be if that pea sized lump was near the surface of the prostate and the doctor detected a hard spot or “nodule”. The only other indication is if a pea sized lump produced a chemical (PSA) that is usually produced by prostate tissue but in greater amounts. Here the “screening” blood test would pick up a higher level of PSA than the average. PSA is not a cancer test but a prostate test. It does NOT diagnose cancer but makes the doctor suspicious enough to then look for cancer. So in summary, prostate cancer causes no symptoms except in late stages. The voiding symptoms that most men over 60 detect have more to do with the common benign enlargement of the prostate known as BPH and have nothing to do with cancer of the prostate. - Dr. David Kauder, M.D.